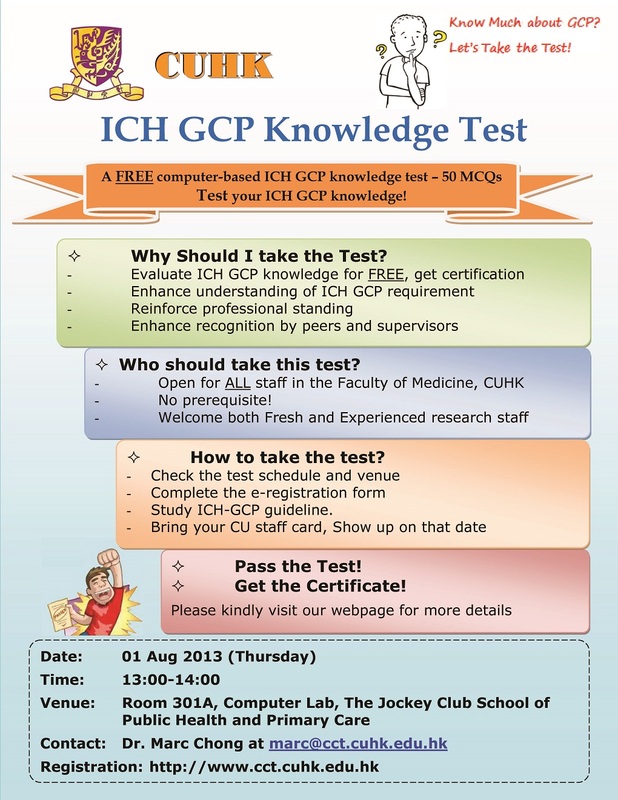 The fundamental ICH-GCP e-test aims to evaluate the basic knowledge of ICH-GCP. It is a computer-based test with 50 multiple choice questions. You are required to complete all questions within one hour. The test is free for all staff of the Faculty of Medicine of CUHK. There is no pre-requisite requirement. The study materials included [ICH–Good Clinical Practice E6] and [ICH–Clinical Safety Data Management: Definitions and Standards for Expedited Reporting E2A]. The registration date and time are fixed and since space is limited (i.e. max. capacity of 20 seats), the test is being offered on first come first serve basis. You have to use your staff ID and CWEM password to access the system and take the test on the test date. A certificate valid for two years will be issued if you scored more than 80% on the ICH-GCP test. If you score lower than 80% on the ICH-GCP e-test, you can study the ICH-GCP guideline again and re-take the test in 2 months. We strongly encourage you to take the e-test and to be recognized by others that you have the fundamental knowledge of ICH-GCP.